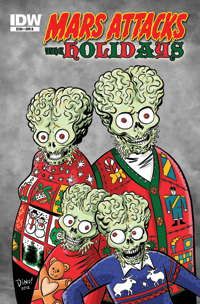 Mars Attacks The Holidays runs the gambit. From goofy to heartbreaking and back again, it’s one heck of a great read. And I have to tip my hat to IDW Publishing for putting out an actual HOLIDAY special this year! They’re one ahead of any other company out there in that respect. OK, there’s a LOT of ground to cover, so I’ll try and get right to it and not bog you down too much. First off, there’s four stories here, each representing a different holiday. Included are Halloween, Veterans Day, Thanksgiving and Christmas. Fred Hembeck’s Halloween story is typical Fred Hembeck. It’s set in the 1950s and follows a Happy Days like family on a trick or treat excursion, and later a Halloween party where things go…awry, thanks to three Martians who tag along. It’s funny and goofy from the first panel to last, and is, in my opinion, the best in the book. Astonishingly, Youngblood #71 is something that falls into the “things I didn’t know I wanted or needed category,” like Rocky Balboa — who knew we needed an official ending to the Rocky story? Not me, but it sure was awesome. Also, the film Rambo. The last scene where John Rambo walks down the driveway to his family’s farm was, again, an ending that I didn’t know I needed. But again, I was surprised and satisfied that I got it. Truth by told, I stopped paying attention to Youngblood about a couple years after it started coming out, so why then was I excited for this issue? Some would say nostalgia (who, me? ), but most of all, it’s because I have been impressed by the other Image titles that have came back for the 20th anniversary that have been fantastic! And out of all those titles, Youngblood was the only one that I cared about originally. 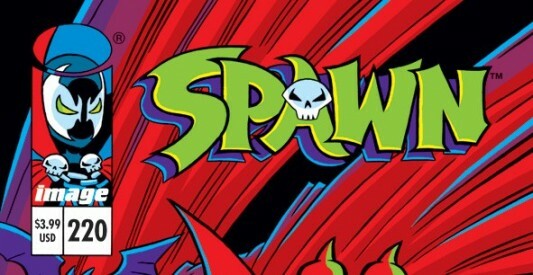 Image Comics announced a wealth of 20th anniversary variant covers for the upcoming Spawn #220, including an adorable cover by all-ages friendly cartoonist Chris Giarrusso, which you can view here below. Spawn #220 marks the return of Spawn creator Todd McFarlane to the series as he takes on writing duties while Szymon Kudranski handles art. 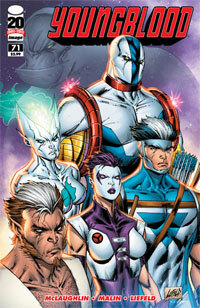 The Chris G. variant stands out, but is only one of the many variants to celebrate Image’s anniversary. McFarlane will be providing two himself, including “Savage Spawn,” an homage to Erik Larsen’s first issue of Savage Dragon and “Youngblood Spawn,” which pays tribute to Rob Liefeld’s Youngbloods.